The bulk of Wendell Berry’s new book is made up of three long essays. These can be read as summaries of Berry’s long career of cultural criticism. Readers of Berry will recognize the problems and challenges that have engaged him from the beginning of his writing career: the corruption of agriculture, the dangers and disasters of industrialization, the neglected power of the western agrarian tradition, and the arrogance of modern and “postmodern” elites. The United States, he argues, will have great difficulty in facing the ever-growing problems created by this corruption and neglect. Chief among our difficulties, he suggests, is our naïve dependence on technological solutions. We have been schooled to believe that technology will solve our problems however apparently intractable. But more often than not, he argues, it was the attempt to use technology against the natural order that got us in trouble in the first place. The second difficulty is a corollary of the first. Given our attraction to powerful technology, we are attracted to big problems that yield to big solutions. Berry’s example is global warming. He acknowledges that global warming is a genuine problem, but argues that it will yield not to big solutions but to millions of small, individual choices made by individuals. Global warming, in other words, is not a technical problem, but a moral, even a spiritual problem. This naïve dependence on technology is found in contemporary agriculture as well. Industrial agriculture treats the farm as a factory and farm animals like machines. Industrial agriculture abuses the animals it depends on, using technology to turn them into genetic monstrosities, unrecognizable in their cramped cages or grim feedlots standing miserably in their own excrement. The focus of the industrial farm is on sustaining profit as opposed to sustaining fertility. The abuses of the factory farms and the cheap food they produce has made it nearly impossible for small farmers committed to the health of their lands and animals to survive. There is a day of reckoning coming, Berry argues, and it will be grim. Our problem, Berry would suggest, is that we are not aware of the power of our own western literary tradition. The agrarian tradition runs through our poets and storytellers like a golden thread. This includes the Bible from which Berry draws a good deal of inspiration in this book and many others. In one essay Berry traces the western agrarian vision through the writings of Alan of Lille, Edmund Spenser, Geoffrey Chaucer, John Milton, and others. He includes the so-called scientific agrarians: Albert Howard and Aldo Leopold among the most prominent. Such men sought to use technology not to extract profit at the expense of fertility, but to preserve fertility to guarantee future sustainable profit. In addition to the essays, Berry includes a story or two and a long poem. 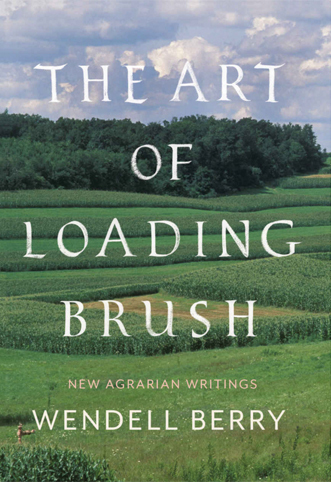 Although I expect and hope Berry will keep writing, The Art of Loading Brush is a fitting summary of a long, rich writing life. It is sharply prophetic, wise, and at times beautiful.